How can a B2B SMB capture and convert search engine traffic and grow its business? A small business, with 30 years in the market, working hard at using the Internet to grow their business - just like lots of other small businesses around this country and across the world. Every day businesses make investments in their company by spending money on their websites, their online digital marketing strategy, and search engine optimization (SEO). They read marketing journals and blogs, hire a consultant, or hire an entire firm to assist them - and the success rates fo results aren’t always so encouraging. Now imagine you are a company that sells a niche commodity online, in direct competition with much larger competitors who benefit from scale and greater resources. How would you approach this investment? Through our work with Michlin Metals, we tackled their challenges in phases. Each point along the way was designed to show progress towards the goal of capturing potential customers and converting them into qualified leads. Each step yielded positive results towards the business’s bottom line and continued a valuable, sustainable growth trend. The strategies we helped put in place did not just drive traffic to the site, they also drove sales leads to the business. The new Michlin Metals website does not just convert visitors into subscribers, it converts visitors into customers. The following case study presents many of the strategies and services that we undertook with Michlin Metals, along with the supporting thought processes that informed our work. Michlin Metals is a 30 year old, woman-owned small business in Chicago that specializes in selling stainless steel, specialty steel, aluminum, aircraft alloys, and "hard to find" materials in various levels of bulk orders. 100% of their new business originates online through their website. 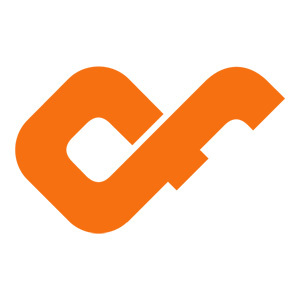 Prior to working with Confluent Forms, Michlin Metals’ website was a hundred static webpages and the company’s goal was to drive traffic through web search and convert customers following an email inquiry. Focus on their online marketing included some limited tracking in Google Analytics and a goal of “a green light” in GoDaddy’s search engine optimization (SEO) tool. While they achieved the GoDaddy SEO goal, the company’s founder wanted still more visibility through keyword searches for the metals they deal and wanted to explore using Google Adwords to generate more traffic to their site. appealing to, capturing, and converting potential customers into actual customers. Before we dive in, it's necessary to define a landing page and a capture page to understand how they're different, and what a goal conversion is. 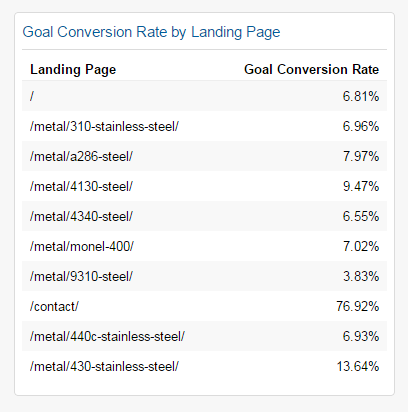 Within the Michlin website, the site’s homepage only accounts for 18% of all landings; 82% of landings happen on the many other pages within the site, primarily the individual metal/shape product pages that have been created. 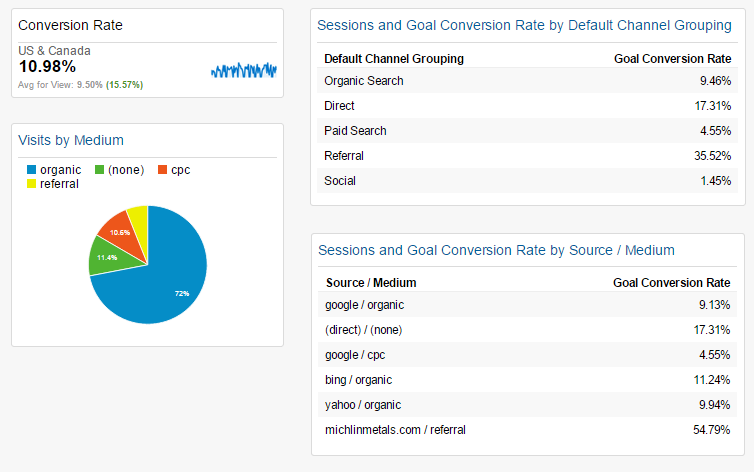 Less than one-fifth of all visits in the Michlin website start at the homepage. With these metrics in mind, we decided to treat each landing/product page as a capture page rather than trying to direct visitors to the “preferred” landing page. Each product page aims to fulfill the content obligations of the user and search engine, providing details about the metal, the shapes available, etc., but its primary purpose is to efficiently move the visitor to the various ways that they can initiate a sales inquiry. At both the top and bottom of the pages, as well as within the content areas of the page, are click-to-call and request-a-quote functionalities (calls to action or CTA). In addition there is a live chat box attached to the bottom right corner of the browser window, and a new interactive metals calculator (that generates a more detailed quote inquiry). The user is seeing one or more ways to initiate contact with the sales team of Michlin Metals at all points within the visible portion of the web page. By clicking on any of the contact points, the site is recording a goal conversion in Google Analytics for each visitor as they enter the sales funnel. 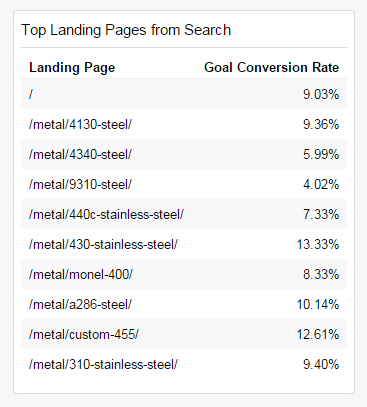 Our work with Michlin Metals began before the redesign process with an analysis of the company’s metrics in Google Analytics and Google Webmaster Tools. What we discovered was mediocre placement and search engine traffic to a variety of pages; some pages ranked on the first page for long tail searches, others not so highly, and all were generally surrounded by competitors with little discernable differentiation. So we undertook a strategy of intent-based search optimization. Intent-based Search Engine Optimization is the strategy of identifying intent-based queries that your target audience might be using, aligning your content to fulfill that intent, then positioning the messaging of your content displayed within the search engine results page to speak directly to that user’s spoken and unspoken needs. In short, we’re talking about using the right bait to attract a specific fish. What we arrived at was a small tweak; we’d optimize for “[type] [shape]”. 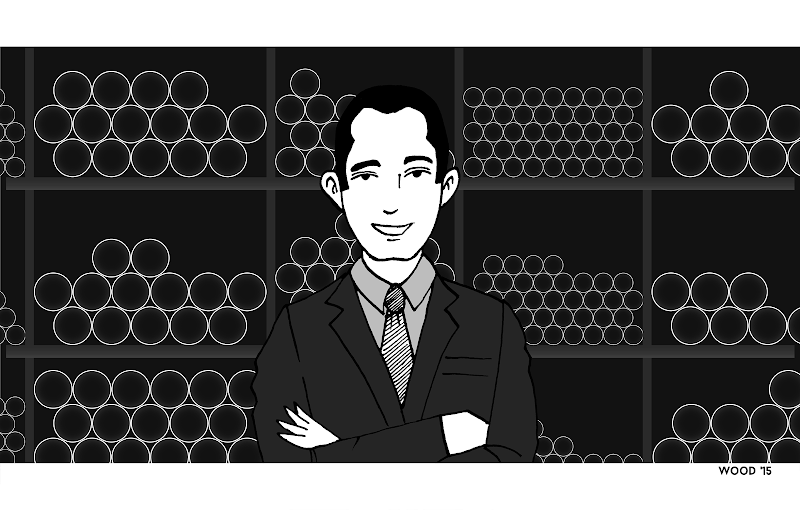 In the case of 4340 steel, the search we would target would instead look like “4340 tubing”. By adding tubing into the query, we now know the searcher is looking for a product to buy based on the shape that they’re querying. The second part of this optimization was to look at the meta description text that displays in the search results, the text that gets displayed under the title of the page. If you were searching for 4340 tubing with the intent to purchase, which text would you click on? That was our gamble, and we pretty quickly began seeing a consistent upward trend in impressions, clicks and click-through rates, and then position. How does this affect position? Because we are clearly targeting intent-based queries, and the website is effectively capturing them (discussed later), the lack of returning visitors to the search engine query is not sending a negative signal to the engine, indicating a valuable and successful visit to the Engine. Since search engines aim to provide the most valuable results in its SERP, a result without pogo feedback would naturally rise in the rankings. 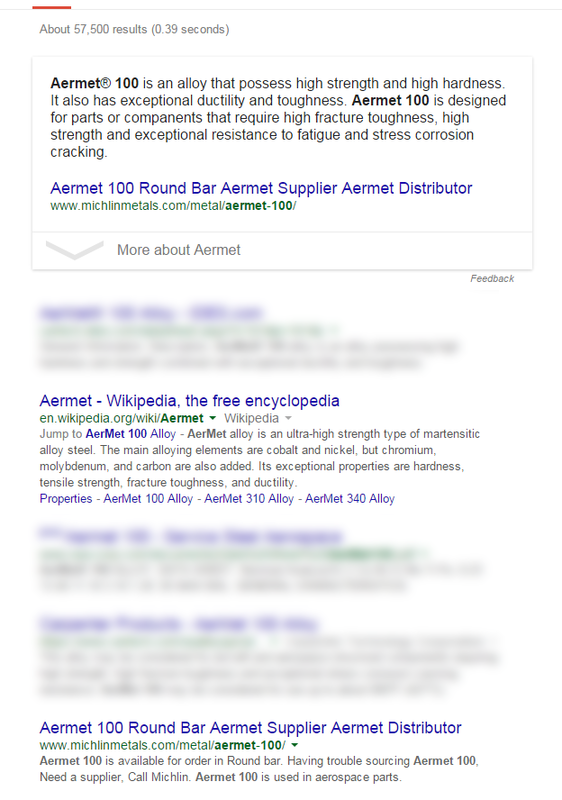 On May 15, 2015 it was discovered that at least one of the pages of Michlin Metals is now being featured in a Google Answer Box for the general product query. While Michlin was ranking at position #5 for the general product query, it was quoted and linked to in the answer box at the top of the page, jumping over the actual steel mill that makes the product and Wikipedia in the process. The Michlin website redesign and redevelopment was based around the migration of the site from approximately 100 static web pages to a dynamically-driven Wordpress-based site, utilizing a custom “metals product” database and management tool. 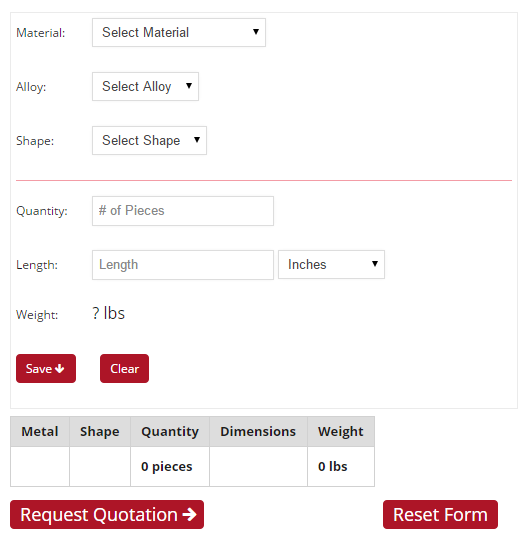 Focusing specifically on the Metals products, the database consists of a main “metals” table as well as six sub-tables of structured data (materials, industries, shapes, applications, attributes, and specifications). The flexibility provided by this approach enables future creation of focused “silo” landing pages based around each piece of tabular data, as well as feeding into the rich formatting and microformatting described in the next section. For example, one of the options created in the “applications” table is the value “aerospace”. An Aerospace Applications page can be enabled in the site, listing out all of the common products and formats commonly requested for aerospace applications. These focused theme web pages typically perform very well from both a SEO perspective as well as a user conversion conversation. Moving the site into a content management system (CMS) enables Michlin to quickly and easily implement content changes in existing pages, as well as to create new pages for the site and new metal product pages. Even when the changes are not directly related to search engines and positioning, the improvements made to the user experience can lead to significant effects on search engine placement. Microformatting is the web-based approach to providing semantic markup to convey metadata and other attributes in web pages and other contexts, mainly for the purpose of providing additional information to entities attempting to process that data (in this context, search engines). Within the Michlin website, each metal type is microformatted using the Schema “Product” type, which includes its name, alternate names, and description. 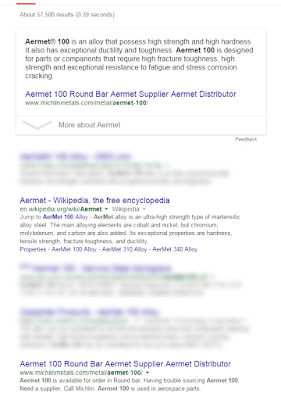 This structured data is akin to lending Google and other search engines “a helping hand”, helping the index and algorithm better process the data found in each web page, structure it accordingly, and derive additional semantic value that can often improve the display of the page in related searches and search rankings. While a minority of sites across the web have microformatting in place, the key here is that few if any of Michlin’s competitors have any set up within their sites. This can not be confirmed, but it is our belief that this plays favorably in Michlin’s appearance to Google and other engines. The microformatting is structured into the template of the site, so that each new product created by the content management system automatically includes this rich markup. A key aspect in the metrics that have been put into place has been not just to track current success, but to be able to gauge the current status of any page within the site as well as run experiments on the site. These experiments, for example changing the structure of a page’s title, can be run on a small subset of pages, and based on the results, be widened and replicated on other pages if they prove successful. 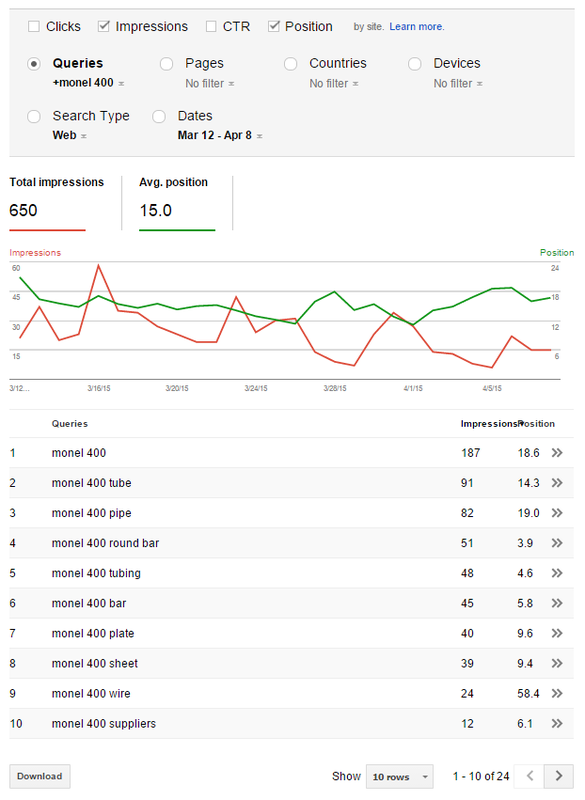 Using a combination of Google Analytics and Google Webmaster Tools reports, we’re able to track the position of each page for specific queries, the number of impressions it receives in Google search, how many clicks it receives, and whether the numbers are increasing or decreasing. By comparing the most recent 28 days of data with the 28 days of data before it, we’re able to run experiments using the scientific method (purpose/question, research, hypothesis, experiment, data/analysis, conclusion) to continually improve the website standing, traffic, and sales conversions. As an example, we might identify a page that is over-performing the site average, or under-performing. 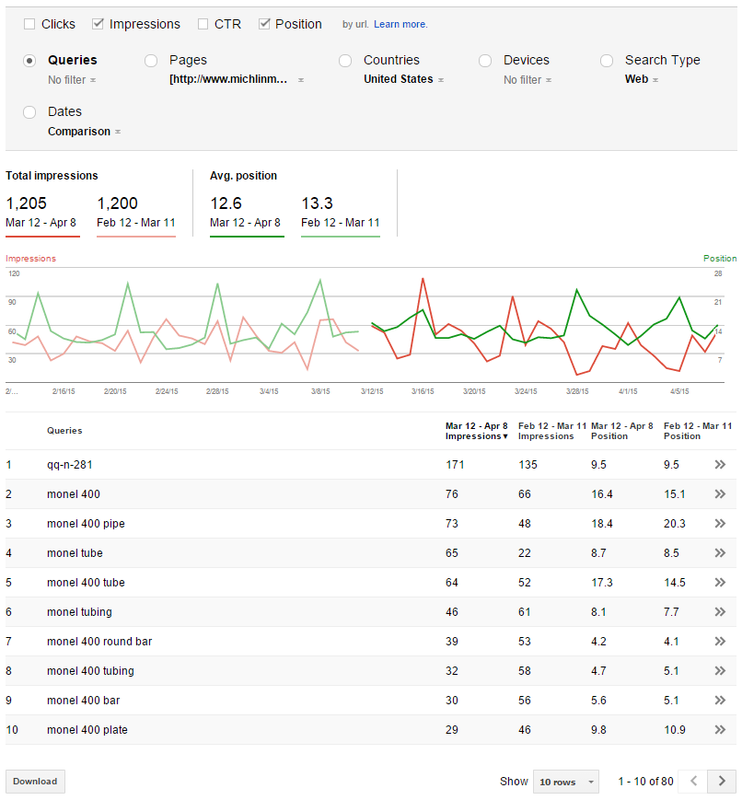 Using the Webmaster Tools’ new search analytics functionality, we can limit the data to show all search queries that display this page, as well as the metrics regarding each query that led to a click or not. We can compare this to a list of queries that we’d like to be displaying for that may or may not be included, and test changes to title tags, meta descriptions, and even page content that might impact that page being shown. Another example is that we can get related search query data that we might be showing up in, such as the image below. We might find that variations in a word, such as tube vs tubing, might seem small to us but have upside potential for position and clicks. The previously mentioned content management system makes this easy for Michlin, as well as leaving notes for themselves within Analytics using the annotations functionality. While much of the focus has been on “ready to buy” intent, this has not been the only area getting attention. The building of a metals calculator was undertaken specifically to target the “general queries” arena, providing a valuable and inherently “sticky” tool to capture the attention of general information visitors. But this calculator is a bit different. This calculator works to move general inquiries into the sales funnel by enabling the calculator user to directly add the results of their calculator session into a Request for Quotation form. The site has now converted a general inquiry into a goal conversion. To make this project a success it was necessary in the beginning to get “buy-in” from the stakeholders at Michlin Metals regarding the vision and strategy we were undertaking, but even more so that they become involved in tracking the progress. It was necessary to get them excited about seeing their metrics, getting them to want to go to them on a daily basis, and encouraging them to explore and start asking their own questions of the data. They needed to be able to start seeking their own actionable intelligence as they were the ones making changes to their content, running experiments, and optimizing. In short, we aimed to make them a more informed client about the web strategy we helped them build, to recognize the value that is being achieved by succeeding at that strategy, and by helping them continually improve their sales capture. We initiated this part of the project (client education) by creating an initial custom dashboard, shared and visible to the client. These charts and data were selected to give them valuable information about conversions, as well as context for how and where these conversions were being initiated. This dashboard acted as a springboard for the client, enabling them to see the charts and data that we had selected for them, but also providing a great segue for the client diving deeper and deeper into the data on their own, or asking follow-up questions of us to explain. The client became curious, and that curiosity fuels institutional buy-in and innovation. You might even say that the most important goal conversion undertaken in this entire project was the conversion of Michlin Metals’ online/website mentality. Michlin Metals transitioned into an actionable intelligence-guided business, learning from their web metrics to influence changes that would positively impact their Internet presence, increase their sales funnel, and fulfill their business objectives. When your website is speaking directly towards the needs of your customers, and giving them easy ways to fulfill their goals and your own, good things happen. This month was the best month of traffic yet, and represents a 40% increase in traffic over last year. The trend line is continually moving upward. The best part is that, as the traffic is moving upwards, so is the conversion rate. The site is actually getting better and better at converting the high quality traffic that is being sent by intent-driven search engine queries, and this past month was the highest rate yet (13.5%). Are you looking to revisit and formulate your Online Presence Strategy? Need help improving your website to better convert your visitors? Want to improve your Mobile SEO?